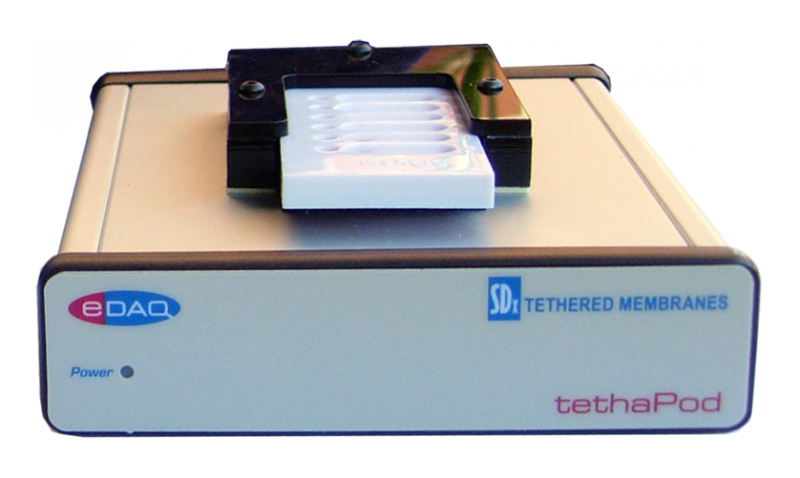 The SDx tethaPod™ measures conductance of tethered phospholipid bilayer membranes. Up to six samples can be measured at the same time using the tethaPlate sample holders. Ideal for studies of embedded ion channel proteins, including screening experiments for potential pharmaceuticals. Each experiment is conducted on millions of 'parallel' ion channels giving a large total ion current, negating the need for the high gain amplifiers and complicated electronics typical of single channel recording techniques, such as patch clamping. Moreover the use of proteins grown by bacterial culture, and purified by modern proteomic methods, ensures that the response is from a single type of ion channel, unlike the results from whole cell, or oocyte, voltage clamping, or Ussing chamber experiments. Each tethaPod (May 2015 or later) is supplied with tethaQuick software to display, store and graph membrane resistance, conductance and capacitance values versus time. Data can be easily exported to Excel or similar software for dose response or other calculations.